Objective Early treatment of patients with rheumatoid arthritis (RA) with combination treatment starting with methotrexate, sulfasalazine, hydroxychloroquine and prednisolone (FIN-RACo strategy) is superior to monotherapy. A study was undertaken to determine whether infliximab (INFL) added to intensified FIN-RACo treatment for the initial 6 months improves the 2-year outcome. Methods 99 patients with early untreated active RA were enrolled in an investigator-initiated, randomised, double-blind, multicentre, parallel-group trial. Primary outcomes were remission and radiological changes at 2 years. All patients started with FIN-RACo. In addition, they were randomised to receive INFL or placebo (Pla) from weeks 4 to 26. Results At 24 months, 66% and 53%, respectively, of the patients in the FIN-RACo+INFL and FIN-RACo+Pla groups were in remission according to the modified American College of Rheumatology (ACR) criteria (p=0.19), 26% and 10% were in sustained modified ACR remission (p=0.042) and 82% in both groups were in remission by 28-joint disease activity score (not significant). Mean changes in the total Sharp-van der Heijde score were 0.2 and 1.4, respectively (p=0.0058). Conclusions Most patients with early active RA achieve clinical remission and develop negligible joint damage with the intensified FIN-RACo regimen. Adding INFL for the first 6 months delays radiological progression. However, a considerable proportion of patients did not reach remission or the remission was transient.1 ,4 We therefore decided to study whether the addition of infliximab (INFL) during the first 6 months on an intensified FIN-RACo regimen (higher dose and more rapid escalation of MTX) would increase the frequency of remissions and reduce the rate of radiological progression compared with the FIN-RACo regimen only. Here we report the 2-year results of this NEO-RACo study. Eligible patients fulfilled the ACR classification criteria for RA,11 were aged between 18 and 60 years, had symptoms for ≤12 months, were DMARD naïve and not permanently work disabled or retired. They had active disease with ≥6 swollen joints and ≥6 tender joints and at least one of the following: duration of early morning stiffness ≥45 min, erythrocyte sedimentation rate (ESR) ≥30 mm/h or C-reactive protein ≥20 mg/l. Patients were excluded if they had been treated with oral glucocorticoids within the previous 6 months or with intra-articular glucocorticoids within 30 days, had contraindications to study medications, active infection or a history of previous or latent tuberculosis or malignancy (except for basalioma or in situ cervical cancer) within 5 years. This investigator-initiated, multicentre, randomised, placebo (Pla)-controlled study was conducted between March 2003 and April 2005 at 15 rheumatological centres in Finland. The study protocol was approved by the national health authorities and by the ethics committee of the Hospital District of Helsinki and Uusimaa. The study was conducted according to the Declaration of Helsinki. All patients gave informed written consent. The study was registered at http://www.clintrials.gov (NCT00908089). We compared the efficacy of INFL with Pla during the first 6 months added on to the intensified FIN-RACo regimen (MTX, SASP, HCQ+PRED) started openly on all patients (see supplementary online figure S1). Intra-articular glucocorticoids were injected in the presence of any swollen joint. MTX was started at a dose of 10 mg/week, increased by week 14 up to 25 mg/week. Folic acid was prescribed at a dose of 5 mg/week. In the presence of adverse events, MTX could be switched to the subcutaneous form and continued at the maximum tolerated dose (maximum 25 mg/week). SASP was escalated from 1 g/day to 2 g/day by 2 weeks or to the maximum tolerated dose (1–2 g/day). The total weekly dose of HCQ was 35 mg/kg/week. A fixed dose of PRED (7.5 mg/day) was started. All patients received daily 1000 mg calcium and 800 IU vitamin D3 (see supplementary online table S1). 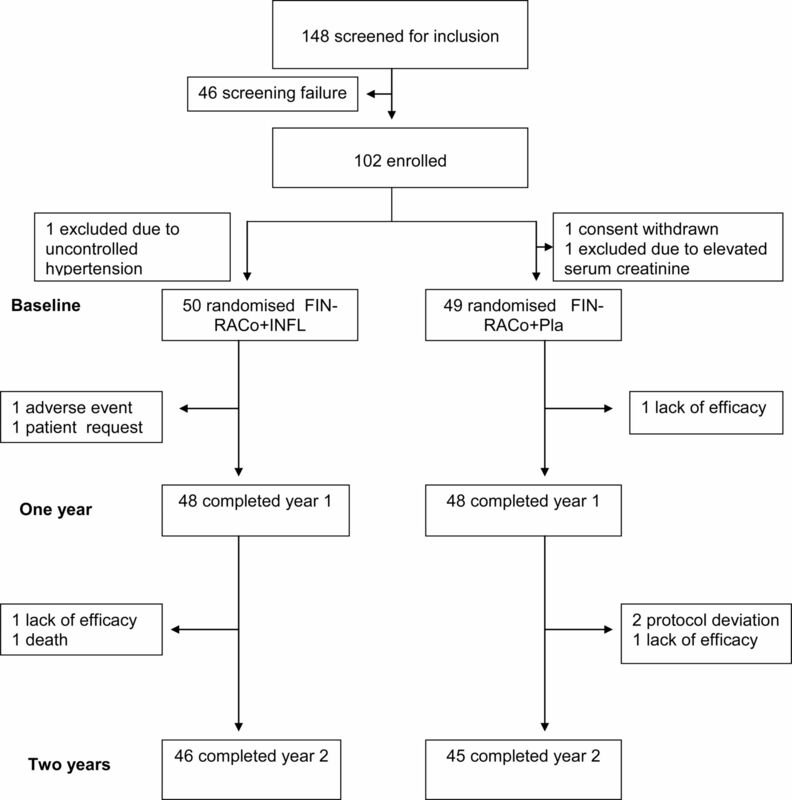 The patients were randomised to receive INFL (3 mg/kg) or Pla at weeks 4, 6, 10, 18 and 26 upon the FIN-RACo treatment (see supplementary online figure S1). The randomisation was performed centrally and stratified according to rheumatoid factor with a block size of 10. At 26 weeks the infusions were discontinued while the FIN-RACo treatment and PRED were maintained in both treatment arms. The treatment in both groups was targeted to remission. We used the preliminary ACR remission criteria3 with the following modification: the patient was considered to be in remission if five out of six variables (morning stiffness <15 min, no fatigue, joint pain, tender joints, swelling in joints or tendons and ESR <30 mm/h in women and <20 mm/h in men) were present and there was no swollen or tender joint. The patients were assessed clinically at weeks 0, 4, 6, 10, 14, 18, 22 and 26 and at months 8, 10, 12 and 3-monthly thereafter. The evaluation consisted of the number of swollen (66) and tender (68) joints, patients’ self-report of pain, physicians’ and patients’ global assessment of the disease activity, physical function as assessed by the Stanford Health Assessment Questionnaire (HAQ) and acute phase reactants. We calculated modified ACR remission and ACR50 response.12 Dose increments in the drugs were based on clinical disease activity. If the patient had been on maximal tolerated doses of the three DMARDs for at least 3 months and was not in modified ACR remission, it was mandatory to change at least one of the drugs to improve the therapeutic response. In cases of allergy/intolerance/inefficacy, MTX was substituted by azathioprine, SASP by ciclosporin, and HCQ by auranofin. Other DMARDs (aurothiomalate, ciclosporin, leflunomide and podophyllotoxin) could also be used. The combination had to include three DMARDs+PRED. If the patient achieved modified ACR remission, three DMARDs with PRED were continued up to the 24-month check-up visit. If, despite dose and DMARD adjustments and intra-articular glucocorticoid injections, the patient was a non-responder (less than ACR50% response) at two consecutive visits after week 26, the patient was regarded as a treatment failure and the therapy was unrestricted, including an option to use other anti-tumour necrosis factor (TNF) blocking agents. Laboratory tests for safety and efficacy were performed at each visit. The target sample size of 100 patients was calculated based on the FIN-RACo study1 in which 25% of the patients in the combination therapy group were in remission at the 6-month visit. With a power of 85% to detect a difference of 30% or greater in the remission rates in patients receiving INFL versus Pla, the size in each group was 50 patients (two-sided α=0.05). Efficacy variables were analysed by intention to treat. All patients who received at least one dose of a DMARD were included in the primary endpoint analysis. Statistical comparisons between groups were made using the t test, Mann–Whitney test, χ2 test or Fisher exact test as appropriate. The generalised estimating equations model with unstructured correlation structure and binomial link function was adapted for longitudinal remission data. Repeated measures for HAQ were analysed using generalised linear mixed models. Fixed effects were group, time and group–time interactions. Radiological progression outcomes were analysed by bootstrap type analysis of covariance with baseline value as covariate because of the violation of distributions assumptions. The CIs for means of radiological outcome were also obtained by bias-corrected bootstrapping (5000 replications). Time-to-event analysis was based on the product limit estimate of the cumulative ‘survival’ function and the log-rank test with Monte-Carlo p values was used to identify the cumulative proportion statistical difference. Ninety-nine patients (67% female, median duration of symptoms 4 months (IQR 2, 6)) started the study (figure 1). Seventy-five (76%) patients were seropositive and 36 (37%) had erosions at baseline. The randomisation was successful (table 1). Trial profile. FIN-RACo, combination therapy started with methotrexate, sulfasalazine, hydroxychloroquine and prednisolone; INFL, infliximab; Pla, placebo. 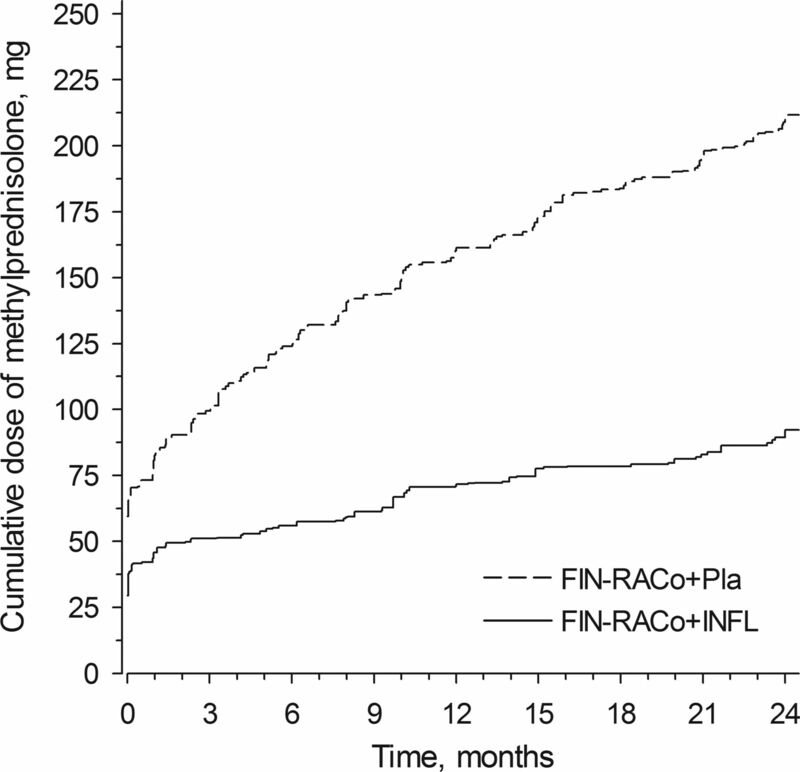 At 24 months, 33 patients (66%) in the FIN-RACo+INFL group and 26 (53%) in the FIN-RACo+Pla group were in remission according to the modified ACR criteria (p=0.19). Sustained modified ACR remission was achieved by 13 (26%) and 5 (10%) patients, respectively (p=0.042; figure 2A, table 2). (A) Remission proportions during the first 2 years by the modified American College of Rheumatology (ACR) criteria and the 28-joint disease activity score (DAS28) remission criteria. Proportions with 95% CIs based on generalised estimating equations model. (B) Cumulative percentage to first modified ACR remission. (C) Health Assessment Questionnaire (HAQ) scores at baseline and at 3, 6, 12, 18 and 24 months. Values are mean and 95% CIs. FIN-RACo, combination therapy started with methotrexate, sulfasalazine, hydroxychloroquine and prednisolone; INFL, infliximab; Pla, placebo. 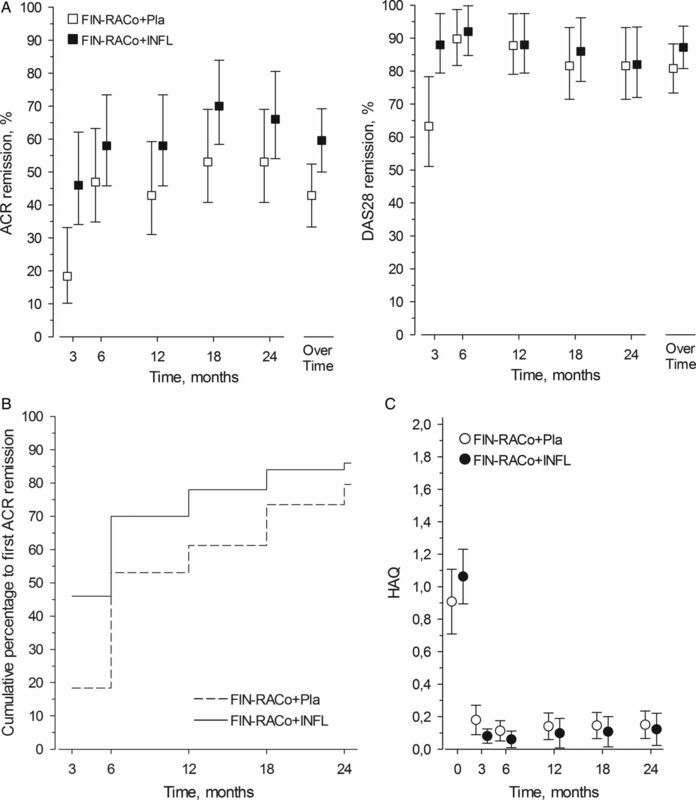 The time to first remission was shorter in the FIN-RACo+INFL group (p=0.049; figure 2B). From month 3, HAQ was low in both groups (figure 2C). Radiological progression was minimal in both treatment arms (table 2). Joint changes did not progress in 80% of the patients in FIN-RACo+INFL group and in 53% of the patients in the FIN-RACo+Pla group (p=0.006). The median (IQR) maximal dose of MTX was 20 mg (15, 25) in the FIN-RACo+Pla group and17.5 mg (15, 25) in the FIN-RACo+INFL group (p=0.040). There was no statistically significant difference between the treatment arms in the discontinuations of MTX, SASP and HCQ (see supplementary online figure S2). MTX was discontinued permanently in four patients (8%) in the FIN-RACo+Pla group and in six patients (12%) in the FIN-RACo+INFL group (not significant). The median (IQR) number of intra-articular glucocorticoid injections was slightly higher in the FIN-RACo+Pla group than in the FIN-RACo+INFL group (4 (1, 10) vs 2 (0, 6); p=0.016). The cumulative dose of methylprednisolone equivalents injected intra-articularly was 212 mg vs 92 mg, respectively (p=0.008, figure 3). Cumulative dose of glucocorticoids injected (methylprednisolone equivalents). FIN-RACo, combination therapy started with methotrexate, sulfasalazine, hydroxychloroquine and prednisolone; INFL, infliximab; Pla, placebo. Treatment with a TNF-blocking drug was started in three patients (two in the FIN-RACo+INFL group and one in the FIN-RACo+Pla group). Adverse events occurred in 92 patients (93%, table 3). A DMARD was switched to another due to adverse event in 37 patients (37%). Nine (9%) serious adverse events occurred in seven patients. Serious infections needing hospitalisation occurred in five patients (table 3).The prevalence of adverse events did not differ significantly between the treatment arms. Three patients discontinued due to insufficient efficacy. Protocol violation led to discontinuation in two patients (figure 1). This study confirms that the majority of patients with early RA reach clinical remission with tight control and by the use of the intensified combination drug regimen. Further, this treatment strategy results in negligible joint damage. After 24 months, 53% of the patients in the intensified FIN-RACo+Pla group were in modified ACR remission. Adding INFL to the regimen for the initial 6 months increased the modified ACR remission rate up to 66% and almost completely delayed radiological progression. The DAS28 remission rate was very high (82%) in both treatment arms. The higher remission rates than in the original FIN-RACo trial1 ,4 ,8 are probably due to the higher doses and more rapid escalation phase of MTX. Also, unlike in the original FIN-RACo study, we did not taper down the DMARDs in the case of remissions. Our protocol did target remission in all patients and the drug treatment was modified accordingly. We calculated both the modified ACR and DAS28 remissions. The modified ACR remission accepts only patients with no swollen joints (66 joint count) and no tender joints (68 joint count) while the DAS28 remission is more permissive, so the DAS28 remission rates were higher. The same holds true for sustained remissions by modified ACR and DAS28 criteria. Active use of intra-articular glucocorticoids also contributes to the excellent outcomes. In the CIMESTRA study, where intra-articular injections of betametasone were part of the treatment strategy,23 the 2-year ACR and DAS28 remission rates were 35–41% and 50%, respectively, and sustained DAS28 remission rates were 10–15%. Probably because of the more intense use of traditional DMARDs in the current study, the remission rates by both the modified ACR and the DAS28 criteria even in the FIN-RACo+Pla treatment arm were higher than in the CIMESTRA study. We examined whether early use of INFL added to the treatment for the first 6 months could improve the 2-year outcome of the patients. The rate of modified ACR remission was slightly increased (from 53% to 66%), but the DAS28 remission was at the same high level (82%). The ACR50 (96%) and ACR70 (86%) responses were extremely high. In published randomised controlled studies with biological agents in early RA, the ACR50 response rates with a combination of a TNF-blocking agent and MTX varied between 46% and 71%, while the ACR70 responses varied between 33% and 50%.24–27 The DAS28 remission rate varied between 31% and 50%.24 ,25 These figures are all lower than those observed in the present NEO-RACo study in patients in both treatment arms. The results are as expected since, in the clinical trial protocols, dose adjustments of MTX, combinations with other DMARDs or intra-articular injections are not allowed. In strategy studies with preset targets and allowing dose titrations and changes of DMARDs and the addition of biological agents, the outcome in different treatment arms is not very different. The GUEPARD study started MTX combined with adalimumab or MTX as monotherapy in early RA.28 The treatment was adjusted by low disease activity allowing MTX and adalimumab to be tapered down or up after 3 months and the addition of a TNF-blocking drug later in the case of a flare. The DAS28 was more rapidly suppressed in the MTX+adalimumab arm than in the MTX arm. The DAS28 remission rates in the two arms were 36.4% vs 12.5% at week 12 (p=0.0223) and 39.4% vs 59.4% at week 52, respectively (difference not significant) without a significant difference in the consumption of TNF-blocking drugs. The results are lower than in the NEO-RACo study, probably due to targeting to low disease activity (and not to remission) and rapid tapering of MTX and adalimumab. Also, the results in the CIMESTRA study23 and the clinical outcomes in the BeSt study17 were much the same between the treatment arms. Compared with the current study, the BeSt study had a similar approach in one of the treatment arms (start MTX with INFL, allowing dose changes and targeting to low disease activity).17 After 2 years about 30% of the patients had ACR70 response,17 a figure considerably lower than the 86% in the FIN-RACo+INFL arm in the current study and also lower than the 71% response in the FIN-RACo+Pla arm. The use of MTX as monotherapy, targeting to low disease activity instead of remission and tapering down/discontinuing drugs in the case of low disease activity for >6 months may have contributed to the results. In conclusion, the present NEO-RACo study confirms that intense treatment from the time of diagnosis with a combination of three DMARDs and prednisolone, liberal use of intra-articular glucocorticoid injections and targeting to remission results in excellent clinical outcomes in the vast majority of patients. The addition of INFL for the first 6 months induces remission more rapidly, increases the probability of sustained remission during the first 2 years and further retards radiological progression. The differences compared with the Pla arm were, however, very small. At present the routine addition of INFL to the NEO-RACo treatment strategy is not justified. The authors would like to thank all participating patients, study nurses and co-investigators.
. Comparison of combination therapy with single-drug therapy in early rheumatoid arthritis: a randomised trial. Lancet 1999;353:1568–73.
. Treating rheumatoid arthritis to target: recommendations of an international task force. Ann Rheum Dis 2010;69:361–7.
. Modified disease activity scores that include twenty-eight-joint counts. Development and validation in a prospective longitudinal study of patients with rheumatoid arthritis. Ann Rheum Dis 1995;38:44–8.
. Definitions of remission for rheumatoid arthritis and review of selected clinical cohorts and randomised clinical trials for the rate of remission. Clin Exp Rheumatol 2006;24(Suppl 43):S22–8.
. Early suppression of disease activity is essential for maintenance of working capacity in patients with recent-onset rheumatoid arthritis: five-year experience from the FIN-RACo trial. Arthritis Rheum 2005;52:36–41.
. Monetary value of lost productivity over five year follow up in early rheumatoid arthritis estimated on the basis of official register data on patients’ sickness absence and gross income: experience from the FIN-RACo Trial. Ann Rheum Dis 2006;65:899–904.
. Should improvement in rheumatoid arthritis clinical trials be defined as fifty percent or seventy percent improvement in core set measures, rather than twenty percent? Arthritis Rheum 1998;41:1564–70.
. Biannual radiographic assessments of hands and feet in a three-year prospective followup of patients with early rheumatoid arthritis. Arthritis Rheum 1992;35:26–34.
. Radiographic evaluation of rheumatoid arthritis and related conditions by standard reference films. Acta Radiol Diagn (Stockh) 1977;18:481–91.
. Comparison of treatment strategies in early rheumatoid arthritis. A randomized trial. Ann Intern Med 2007;146:406–15.
. Factorial randomised controlled trial of glucocorticoids and combination disease modifying drugs in early rheumatoid arthritis. Ann Rheum Dis 2008;67:656–63.
. Aggressive combination therapy with intra-articular glucocorticoid injections and conventional disease-modifying anti-rheumatic drugs in early rheumatoid arthritis: second-year clinical and radiographic results from the CIMESTRA study. Ann Rheum Dis 2008;67:815–22.
. Combination of infliximab and methotrexate therapy for early rheumatoid arthritis. A randomized, controlled trial. Arthritis Rheum 2004;50:3432–43.
. Very early treatment with infliximab in addition to methotrexate in early, poor-prognosis rheumatoid arthritis reduces magnetic resonance imaging evidence of synovitis and damage, with sustained benefit after infliximab withdrawal. Results form a twelve-month randomized, double-blind, placebo-controlled trial. Arthritis Rheum 2005;52:27–35.
. The PREMIER study. A multicenter, randomized, double-blind clinical trial of combination therapy with adalimumab plus methotrexate versus methotrexate alone or adalimumab alone in patients with early, aggressive rheumatoid arthritis who had not had previous methotrexate treatment. Arthritis Rheum 2006;54:26–37.
. Evaluation of two strategies (initial methotrexate monotherapy vs its combination with adalimumab) in management of early active rheumatoid arthritis: data from the GUEPARD trial. Rheumatology 2009;48:1429–34.
. Infliximab in active early rheumatoid arthritis. Ann Rheum Dis 2004;63:149–55.
. Comparison of etanercept and methotrexate, alone and combined, in the treatment of rheumatoid arthritis. Two-year clinical and radiographic results from the TEMPO study, a double-blind, randomized trial. Arthritis Rheum 2006;54:1063–74.
. A meta-analysis of the efficacy and toxicity of combining disease-modifying anti-rheumatic drugs in rheumatoid arthritis based on patient withdrawal. Rheumatology 2005;44:1414–21. Contributors The study was designed by the principal investigator in collaboration with other investigators of the NEO-RACo Study Group and all data were collected by the Study Group. All the investigators contributed to the design, analysis and writing of the report. ML-R was the principal investigator and study centre coordinator. The administrative board of the study consisted of ML-R, TM, MK, MJK, OK-S and RL. LL evaluated the radiographs. Data collection and statistical analysis were done by HK. Funding The study was supported by grants from the Helsinki University Central Hospital Research Funds, from Finska Läkaresällskapet and from the research funds of participating hospitals. An unrestricted grant was provided by Schering-Plough Finland, which was used for the purchase of infliximab. Schering-Plough Finland also provided support for investigator meetings. Competing interests ML-R has received honoraria and consulting fees from Abbott, Bristol-Myers Squibb, Centocor, MSD, Pfizer, Roche and UCB. LL has received consulting fees from Abbott. MK has received honoraria and consulting fees from Abbott, BMS, GSK, MSD, Pfizer, Roche and UCB Pharma. MJK has received honoraria from Abbott, BMS, GSK, MSD Finland, Mundipharma, Pfizer, Roche and UCB. OK-S has received honoraria from Abbott, BMS, GSK, MSD Finland, Roche and UCB. AK has received honoraria from Abbott, Actelion, BMS, GSK, MSD, Pfizer, Roche, Schering-Plough and UCB. KP has received honoraria from Pfizer, MSD, Abbott, BMS, Roche and UCB. PJH has received honoraria from Abbott, AstraZeneca, BMS, GSK, MSD Finland, Mundipharma, Pfizer, Roche and UCB. HAJ has received consulting fees and travel grants from Abbott, GSK, MSD Finland, Pfizer, Roche and UCB. LP has received honoraria from Abbott, MSD Finland, Pfizer, Roche and UCB. HK, RL and EM have nothing to disclose. Ethics approval The study protocol was approved by the National Health Authorities and by the ethics committee of the Hospital District of Helsinki and Uusimaa. Other members of the NEO-RACo Study Group Eeva Alasaarela, Kari K Eklund, Mikko Hakola, Aulikki Kononoff, Maija-Liisa Krogerus, Kari Laiho, Timo Malmi, Helena Niinisalo, Ritva Peltomaa, Jari Pöllänen, Tea Uusitalo, Heikki Valleala, and Kaisa Vuori (rheumatologists) and Riina Nieminen and Katariina Vuolteenaho (pharmacologists).